Great. How embarrassing, starting your period while trying on bathing suits. Especially when you didn’t want to try on bathing suits in the first place. Because you have no intention of swimming. Especially since your mom drowned a year before. On top of that, imagine running into him, that boy who hasn’t spoken to you since that unfortunate incident during spin-the-bottle. Just ‘cause Luke’s been gone on a sailing trip for six months doesn’t mean anything has changed. Oh, and you can’t tell your best friend you started because you lied and told her it had already happened a couple of years ago. And did I mention that the brand of the suit is your mother’s first name? Unfortunately, this emotional day is not over for Jade…hoping to relax in a tub full of Epsom salts, soothing away the day (along with her cramps), she dozes off only to wake and notice that she she inexplicably has…a tail. Weirder still, her dad doesn’t seem at all surprised. Jade starts to learn the truth about who she is and what her mother was, but because she’s been forbidden to tell even her best friend Cori, it starts to drive a wedge between them. Plus, why in the world is she just about literally running into Luke Martin all over town? And why is she starting to have feelings for him? Where is her mother when she needs her? This is a sweet story with just enough drama to pull you along. Add into that some twists and turns, and you will (maybe) be surprised at the outcome. This is the first in a series, so it will be fun to see what’s in store for this little mermaid. While there is talk of periods and boys, it seems to be for the younger end of YA. 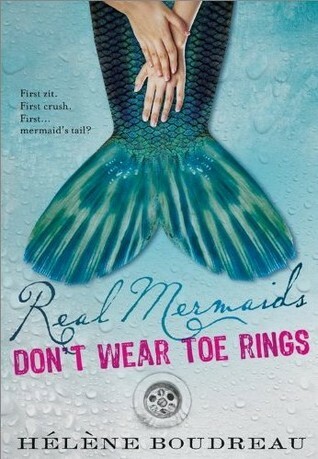 Real Mermaids Don’t Wear Toe Rings by Hélène Boudreau was published December 10, 2010 by Sourcebooks, Inc.. Ink and Page purchased this book, so no one had a choice about whether it was reviewed. This sounds cute with some humor, glad you were entertained! It was! My daughter had read it (she has the first 2 in the series) and has been asking me to read it for about nine months now. She’s happy I liked it.